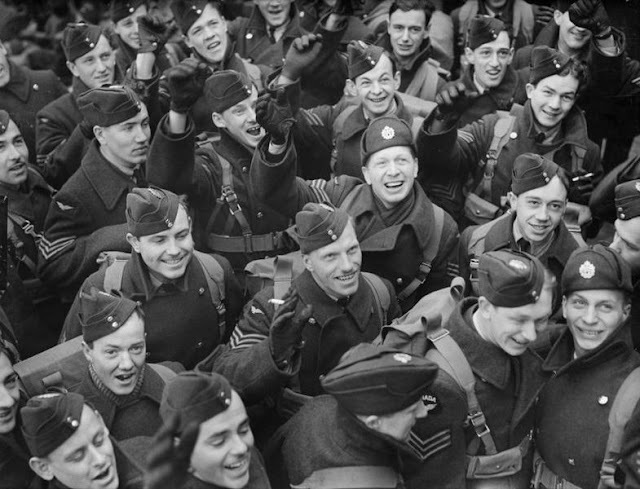 "Canadian sergeant aircrew, trained under the Empire Air Training Scheme, arriving at Gourock in Scotland for service with the RAF, 28 February 1941." © IWM (G. Woodbine, CH 2174). Italian/Greek Campaign: The Greek Epirus Army launches some minor attacks on 28 February 1941 against the Italian 11th Army west of Klisura. They accomplish little in the terrible weather. While the front has become static recently, there are vicious artillery duels and air battles. The RAF shoots down four planes today (according to Italian records), including three CR 42 fighters (the RAF pilots claim 27 planes shot down). According to the RAF records, this is its most successful day during the Greek campaign - but, according to the Italian records, it is not nearly as successful as the British think. These are the kinds of contradictions historians must deal with. The British War Cabinet picks General Sir Henry Maitland Wilson from the Middle East Command to lead the expedition destined for Greece. Gloster Gladiator Mk. 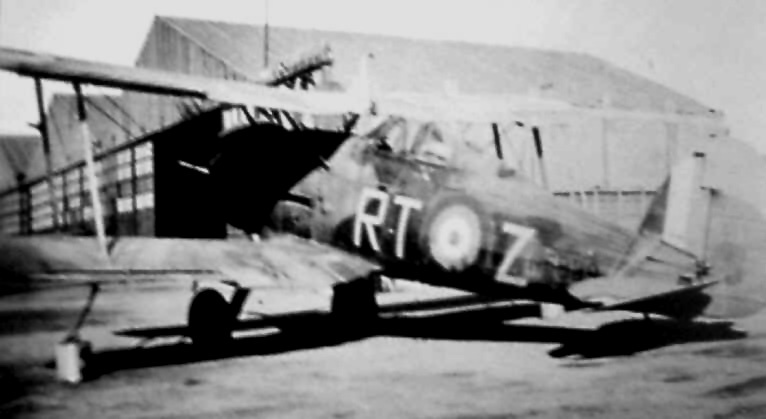 II, RT- Z, N5829, of RAF No. 112 Squadron, Himare, Greece, 28 February 1941. Pilot Officer William "Cherry" Vale, of 80 Sqdn., claimed an Italian G50 and a S.79 in this plane on this date. East African Campaign: The RAF sends Blenheim and Wellesley bombers against Asmara in Eritrea. The British remain blocked at Keren in Abyssinia. However, British forces are expanding on each flank. Attacks are in progress by Briggsforce (primarily 7th Indian Brigade under Brigadier Briggs) at Mescelit Pass about 24 km northeast of Keren. The attacks are carried out in the evening by 4/16 Punjab and two companies of 1st Royal Sussex. The attack is both a frontal and flank attack. European Air Operations: RAF Bomber Command sends another 23 Hampden bombers (based at RAF Waddington) to bomb German battleship Tirpitz at Wilhelmshaven. The weather is poor, with low clouds. Only four of the bombers even spot the target. As usual, the Tirpitz emerges unscathed. It is the 16th raid so far against the Tirpitz, with absolutely no success and many British bomber losses. THe RAF also launches other attacks against facilities at several Channel ports (Lorient, Boulogne, Emden). The Luftwaffe is fairly quiet both during the day and after dark. There is a small raid against London during the night. While the Battle of Britain technically is over, the Blitz continues. During February 1941 in Great Britain, there are 78 dead and 1068 badly wounded civilians. So far in 1941, through the end of February, there have been 2298 killed and 3080 wounded. increasingly anxious about high rate of shipping losses in North-Western Approaches and shrinkage in tonnage entering Britain. This has darkened since I last saw you.... The strain is growing here. Churchill apparently is referencing the recent devastations of Convoys OB 29 and OB 290. Convoy losses indeed are up this month (see below). This ship must on no account be sent to the East coast. It contains 1,700 machine guns, 44 aeroplane engines, and no fewer than 14,100,000 cartridges. These cartridges are absolutely vital to the defence of Great Britain.... That it should be proposed to send such a ship round to the East coast with all the additional risk, is abominable. Previously, Churchill has chided the Admiralty for not taking more care of specific ships with valuable cargo. This memo shows that he continues to keep a very close eye on important shipments. German heavy cruisers Gneisenau and Scharnhorst are east of of the Azores. They complete their refueling from tankers Ermland and Friedrich Breme at 07:00. Their objective is to interdict the convoy route between Freetown and Great Britain. Next objective is the vicinity of the Cape Verde Islands. British 10,000 ton liner Anchises, badly damaged during Luftwaffe air attacks by I,/KG 40 Focke-Wulf Fw 200 Condors on the 27th, begins taking on too much water at around 11:30. This causes the 33 crew still aboard to abandon ship. Corvette HMS Kingcup comes over to take them aboard, and one of the lifeboats is sucked under the Kingcup, killing a dozen crew. The Anchises remains afloat until the afternoon, when the Condors return and send the ship under. U-47 (Kptlt. Günther Prien) surfaces and uses its deck gun to sink 4233 ton British freighter Holmelea in the Northwest Approaches. There are 28 deaths, while 11 crew survive. This is an especially interesting sinking because Kptlt. Otto Kretschmer originally attacked the Holmelea, but did not succeed. Captain John Robert Potts, however, was not fortunate enough to survive attacks by two of the most dreaded U-boat captains. He perishes with most of his crew. U-108 (K.Kapt. Klaus Scholtz), on its first patrol out of Wilhelmshaven, gets its second victim. It torpedoes and sinks 6461 ton British freighter Effna. This is another ship of many around this period of time in which all of the crew perish. Italian submarine Michele Bianchi torpedoes and sinks 6803 ton British freighter Baltistan from Convoy OB 290 in the Atlantic south of Iceland. There are 51 deaths and 18 survivors. Different sources place this sinking on different days around this date. British 534 ton freighter Cabenda hits a mine and sinks in the Bristol Channel west of Cardiff. This has been an area of multiple sinkings already in 1941. There is one death. In a special tragedy among many others, 2085 ton Egyptian freighter Memphis founders in heavy weather northwest of Ireland. Everybody on board perishes, another such ship during these cold winter months (it is not the Germans who kill all of these people, except indirectly; it is the climate and weather). The deaths include 28 crew pulled out of the water after the recent sinking of the 7034 ton Benjamin Franklin. German Focke-Wulf Fw 200 Condors finish off damaged 3197 ton Swedish freighter Rydboholm. The Rydboholm is one of the last Convoy OB 290 victims. Drifter New Comet, originally damaged by a mine and beached at the mouth of the Tyne on 23 November 1940, was refloated but today finally sinks. Finnish cargo ship Bore VIII (now in German service) founders and is lost bad weather in the Hubertgat. Belgian 5382 ton freighter/passenger ship Persier is driven ashore on the Icelandic coast after losing a hatch and its steering and electrical systems in a bad storm. Aground east of Vik in Myrdalur, she survives and is refloated in April. Persier ultimately is repaired and returned to service. Convoy OB 292 departs from Liverpool, Convoy SC 24 departs from Halifax. 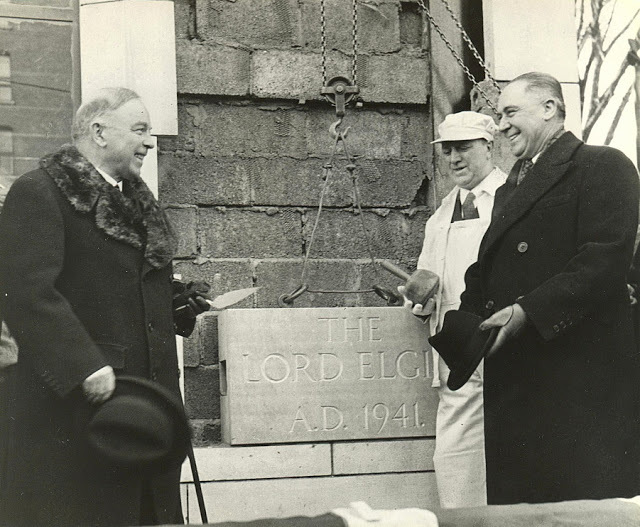 Mackenzie King (with Ottawa Mayor Lewis and contractor John Wilson) uses a silver trowel to lay the cornerstone of the Lord Elgin Hotel on 27 February 1941 (Photo in the Ottawa Journal, 28 February 1941). King kept the trowel to put on display. Incidentally, there is a time capsule ("hermetically sealed") in that cornerstone. The hotel will open in July 1941, will be refurbished in the 2000s, and remains operational. destroyer depot ship HMS Tyne (Captain George A. Scott). Destroyer HMS Brissenden and corvette HMS Woodruff are launched, corvette HMCS Kitchener laid down at Sorel, Province of Quebec. Rear Admiral L.H.K. Hamilton becomes the new Rear Admiral Destroyers, Home Fleet. He will place his flag on depot ship HMS Tyne. The U-boat sinkings jump over 50% from January's 126,782 tons, while those sunk by the Luftwaffe and by surface raider also both rise a more modest 10+%. The bulk of the increase of U-boat sinkings is from two convoys late in the month, OB 289 and OB 290. The U-boat fleet remained intact, with no losses. There are 22 U-boats available in the Atlantic, plus many Italian submarines (1 lost during February). Shipping losses are of extreme importance to Churchill, and he analyzes them closely. He notes in another memo to Pound and Alexander today that the risk of loss during inward voyages in the Northwest Approaches is over double those of outward voyages (a ratio of 5:2). He also notes that there appears to be no difference in losses between those in convoy and faster ships operating independently. He questions a proposal to lower the speed limit of the independents, presumably to save fuel. 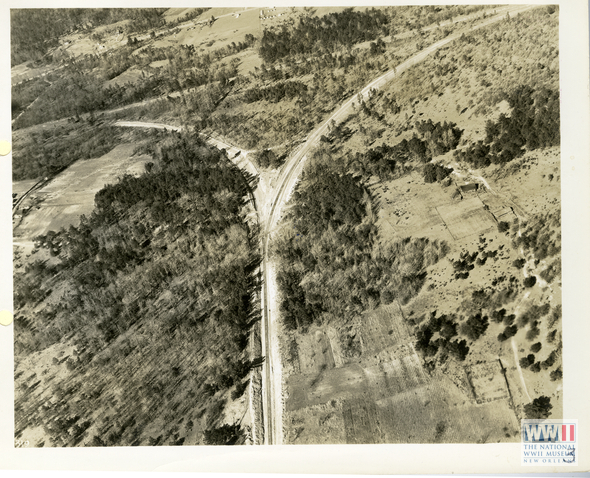 Railroad turnout to Camp Polk, Louisiana on 28 February 1941 (National WWII Museum). Battle of the Mediterranean: The Free French forces have been besieging the Italian fortress of El Tag at Kufra Oasis for ten days. No relief has been forthcoming from the large Italian forces further north. Today, the Italians begin surrender negotiations. The last British commandos surrender on Kastelorizo. This ends Operation Abstention, which has turned into a fiasco. A total of 40 commandos are taken prisoner. 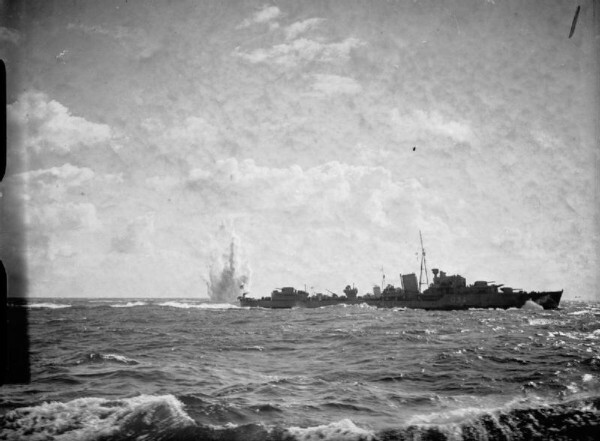 Destroyer HMS Jaguar and the other Royal Navy ships retreat to their bases, having suffered a stunning defeat in what was considered an easy operation in the Aegean. Churchill later comments, "I am completely mystified at this operation." The ultimate cause of defeat is the British tendency to underestimate Italian military ability. This is also going to become an issue in North Africa. Another ship hits a mine in the Suez Canal, but quick thinking mitigates the effect. The skipper of motor anti-submarine boat MA/SB 3 manages to beach his ship to prevent closure of the canal. There are no casualties. The ship will be refloated and repaired. After many days of raids, Malta has a quiet day. The damage from the Luftwaffe attacks after dark on the 27th, however, is extensive. Particularly devastating has been damage from parachute mines. Almost all of the planes at RAF Hal Far airfield are destroyed or out of operation, leaving no effective air defense for the island. Spy Stuff: Soviet leader Joseph Stalin has been receiving isolated warnings about a coming German invasion of the Soviet Union. He has discounted all of them, including one at the end of 1940 by Richard Sorge (code name Ramsay) in Japan. Today, he receives another warning. This warning is from Soviet agent Rudolf von Scheliha (code name Ariets). Von Scheliha is a German diplomat who became radicalized by the horrors he witnessed while serving with the German Embassy in Warsaw. He is a leading member of the "Red Orchestra," a group of highly placed German dissidents who funnel military information to the Soviets via Switzerland. Von Scheliha/Ariets warns about an upcoming invasion. He even supplies a firm date for the invasion, 20 May 1941, which is only a month off (this actually is around the 15 May 1941 date that Hitler has ordained at this time, though it later will be postponed). Stalin ignores this warning, too, viewing it as "English provocation." This is all reviewed in depth in various scholarly books, particularly (all 2005) David E. Murphy, "What Stalin Knew" (Yale University Press); Constantine Pleshakov, "Stalin's Folly" (Houghton Mifflin Company); and Robert Service, "Stalin: A Biography" (The Belknap Press/Harvard University Press). German/Bulgarian Relations: During the night, Wehrmacht troops of the 12th Army under the command of Wilhelm List take up positions in Bulgaria. German/Japanese Relations: Japanese Ambassador Oshima meets with Adolf Hitler at Berchtesgaden. German Military: General Erich von Manstein moves from XXXVIII Armeekorps to take command of LVI Armeekorps after this date (some sources place this transfer on other dates, such as 27 February 1941 and 15 March 1941). US Government: The US Army Air Corps (USAAC) impounds ten NA-69 light attack aircraft ordered by Thailand. These will be redesignated A-27 (serials 41-18890/18899) and be assigned as trainers to the 24th Pursuit Group at Nichols Field in the Philippines. 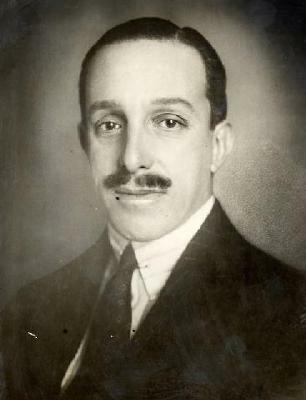 Spanish Government: Former King Alfonso XIII passes away in Rome at age 54 barely a month after renouncing his rights to the defunct Spanish throne. This leaves his son Juan as the heir apparent and also theoretically heir to the thrones of France and Navarre. US Government: The US government ships the last gold reserves from New York City to Fort Knox, Kentucky. Fort Knox is the center of US armored forces and home to the 1st Armored Division. Iraq: Rashid Ali confers with the Grand Mufti and four colonels (known as the "Golden Square"). They discuss a coup against the pro-British government. Rashid Ali and the Grand Mufti are pro-Axis. The British have a large base at Habbaniyah, but are vulnerable in other parts of the country. Li'l Abner, Al Capp (this is personally signed), featuring Moonbeam and Moonshine McSwine, published 28 February 1941. Indochina: The Vichy French cabinet accepts Japan's proposed settlement of the border war between French Indochina and Thailand. The Thais get all of their territorial aims, including all land west of the Mekong River and part of northwest Cambodia. There is no question that Japan has favored Thailand in the settlement. Vichy French Homefront: The government reduces the bread ration from 12 to 10 ounces (350g to 280 grams). By comparison, residents of Jewish Ghettos often are allocated 3 grams. New Black-out features keep directing attention to themselves. There are plays and revues and films running, but the performances are confined to the day. You cannot take a stroll either before or after dinner, because the black-out renders it utterly impossible if there is the least cloud (as there has been since I arrived). At each doorway you see a little bag of sand for the proper treatment of incendiary bombs. He also notes a certain fatalism in London residents, along the lines of "I stay in bed. If the bomb's meant for me it'll hit me; if it isn't, OK." Menzies admits to feeling the same way, though he is secure on a lower floor of the well-built Savoy. 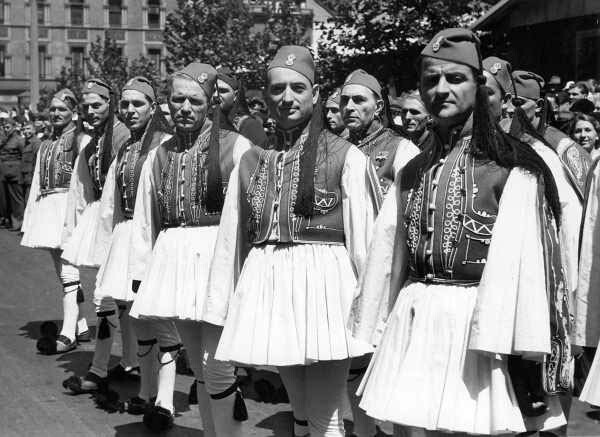 Greek Evzones (soldiers) participating in the Greek Day parade in Sydney, Australia, 28 February 1941 (State Library of Victoria [an016346]).